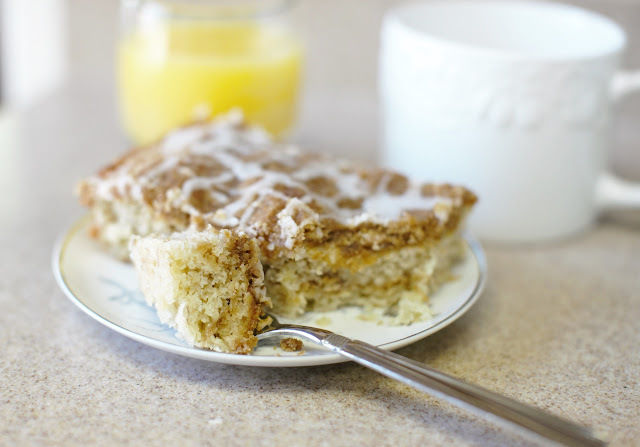 This coffee cake is so yummy, it's good any time of day! 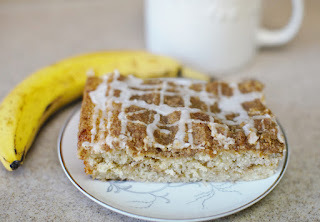 A robust banana flavor with a streusel filling it's a great alternative to your standard banana bread. Preheat oven to 350 degrees. Spray a 9 x 13 baking dish with cooking spray, set aside. In a mixer fitted with a paddle attachment, mash bananas until they become liquified. Mix in butter until combined and then mix in sugar, eggs, milk, and vanilla. With mixer running on low, carefully add flour and mix until just combined. Prepare streusel by combining all the ingredients in a medium bowl, cut the butter in with a pastry blender until a coarse crumb forms. Pour ½ the batter into the prepared pan. Top with 1/3 of the streusel. Cover the filling with the remaining batter and top with remaining crumb mixture. Bake for 50-55 minutes until the center is set and a toothpick comes out clean. Cool at least one hour before drizzling the glaze over the top. These types of projects really melt my heart. Taking an existing item and re-tooling it to benefit the next generation. I've done this with veils, garters and other bridal related items. The gesture is so generous, sentimental and heartwarming; I'm all in....one way or the other, all you need to do is ask! This particular project was a first for me. Taking Mom's wedding gown and constructing a baptismal gown (from the train) for her six month old daughter. 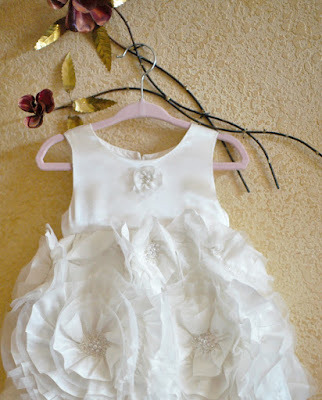 The skirt of Mom's gown was so unique, I knew the minute I saw it, that it was going to make an awesome baptismal gown. 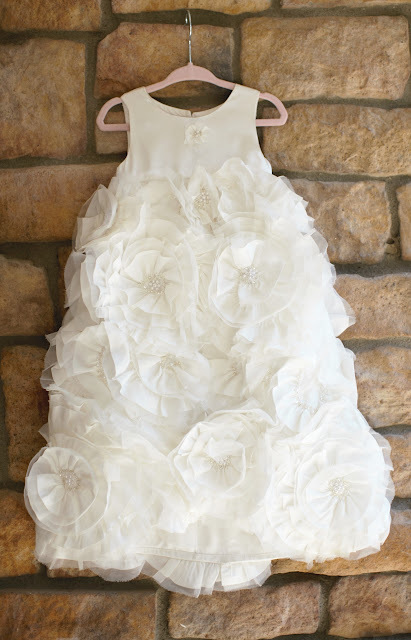 The flowers are made with a continuous ruffle of taffeta and organza (taffeta layered on top of the organza) wound and sewn into a large circular pattern; the center of each flower is filled with pearls and beads. In between the flowers is a serpentine of ruffling, creating the illusion of a solid floral pattern. 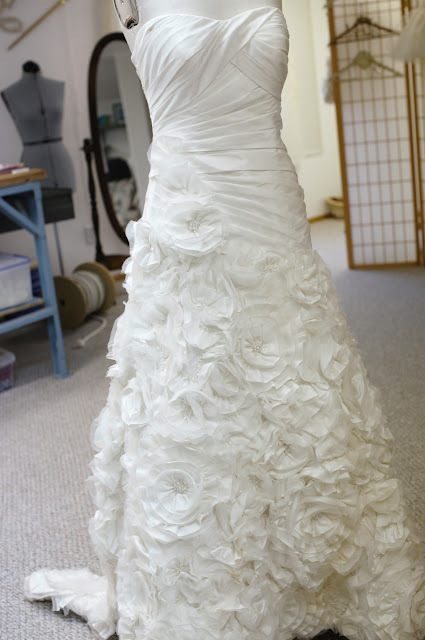 I was amazed at how heavy the gown was, I can't imagine how exhausting it must have been wearing it on the wedding day! Mom and I both agreed that the top of the gown should be very basic, allowing the skirt to be the centerpiece of the gown. Mom wanted a sleeveless bodice similar to one of her daughter's two piece outfits that is one of her favorites. I had some remnants of satin which perfectly matched the color of the gown to use for the bodice, so once I created the bodice pattern, I was ready to go to town at the sewing machine. Once I had sewn the "skirt" (that I had created from the train) to the bodice, I chose to strategically place some additional smaller flowers in between the larger flowers, specifically on the front of the gown. I wanted to create a more continuous floral pattern and eliminate some of the spaces between the flowers where there was just ruffling. The back of the bodice has a keyhole opening in the center back with a single loop and covered button as the closure. A tiny matching ruffle flower made from some scraps, added the finishing touch for the center front of the bodice. I absolutely adore how it turned out! 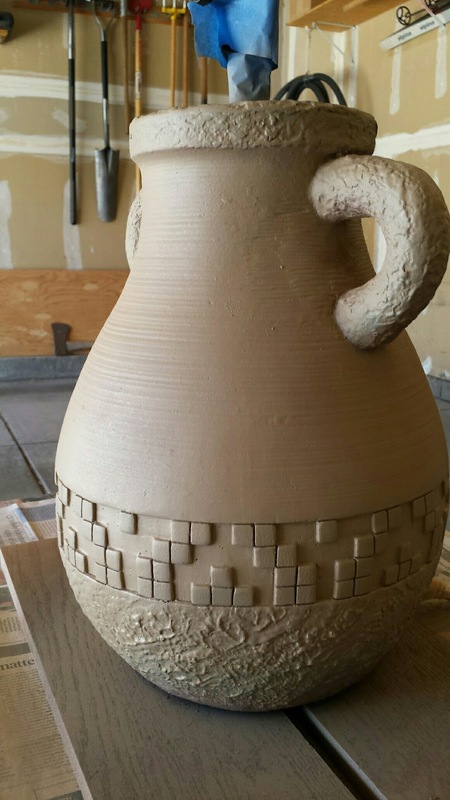 I am so honored to have been a part of creating this piece for the Knight family. Who knows, maybe this gown can be passed along to another generation in the future? If you are looking for a refreshing summer dessert. Look no further.....this is a special treat for sure. Great lime flavor, refreshing and light! So good. * Reserve 1 Tbsp. graham crumbs. 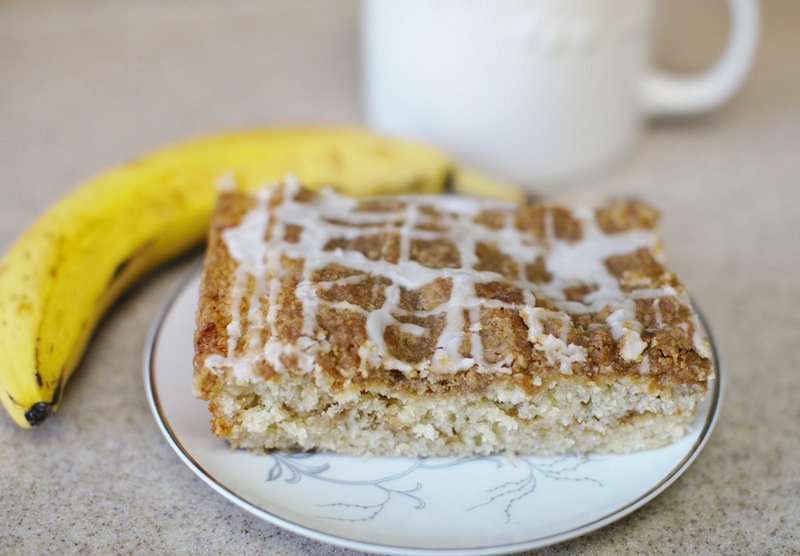 Mix remaining crumbs with butter; press into bottom of plastic wrap lined 9-inch square pan. Refrigerate until ready to use. In a small bowl, add boiling water to gelatin mix; stir 2 minutes until completely dissolved. Add ice; stir 2 min. or until thickened. Remove any unmelted ice. Beat cream cheese in medium bowl until creamy. Gradually beat in milk, then lime juice. Add gelatin; mix well. Whisk in 1 cup Cool Whip. Pour over crust. Refrigerate 6 hours or until firm; Cover with remaining Cool Whip just before serving; sprinkle with reserved graham crumbs. Use plastic wrap handles to remove dessert from pan before cutting into squares. 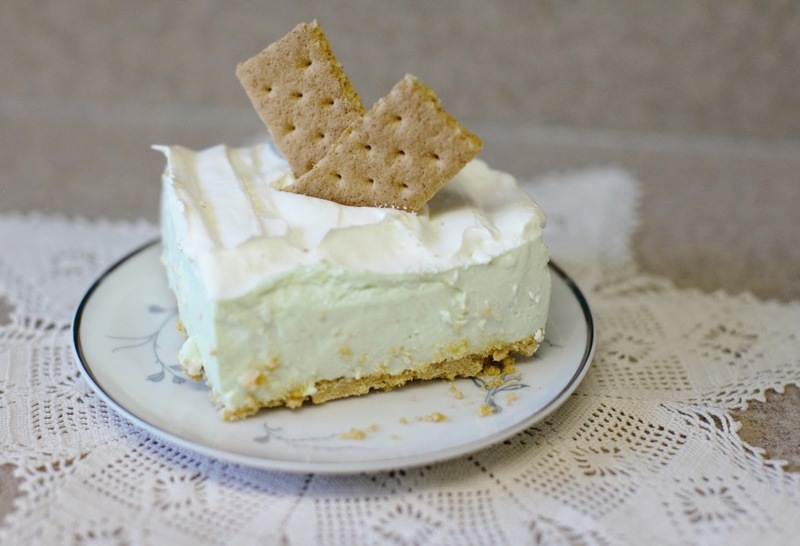 * I chose to use graham cracker squares for the top of mine, versus the crumbs. Thanks to Kraft recipes for this yummy treat! We're about three months out from moving into our new home. The last move we plan to make! A move that has us sifting through 20 years of STUFF, to decide what to move with us, what to donate, what we could maybe sell, and what the heck, I didn't realize we had that? Since making our way to the design center to pick out cabinets, carpet, paint, counter tops, etc. I've been getting more and more excited about how this house is turning into a home. We have plenty of good furniture, prints, and accessories that will be coming along with us....but, a few new touches are definitely in order. I mean, a new house, deserves some new touches! Nothing that will break the bank, but some new life along the way. 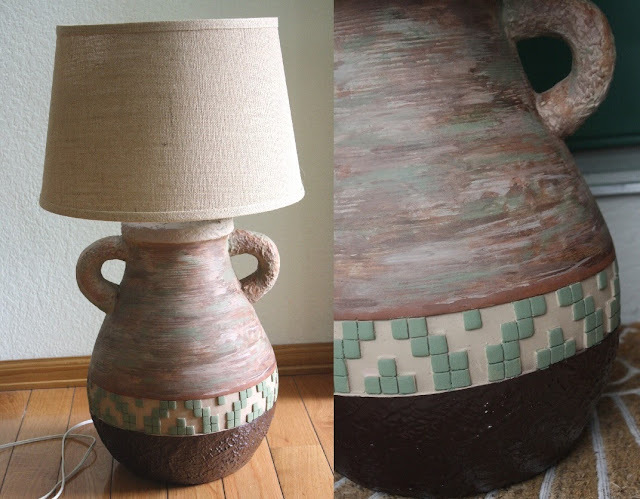 So, I started with some lamps. I can't remember any other table lamps in this house, so I'm thinking they could be going on 20 years old....and frankly, they look it. Rather than purchase new ones, I thought I could give them a makeover since they're made of a ceramic and could be easily painted. I have had a southwest theme going in the family room of this house for a long time; in fact, had we not planned to move, I would have been swapping them out anyway. As you can see, these babies are southwest all the way! So long Southwest.....Hello my Pretties!! The new home decor is going to be earth tone with the accent color of sage green (my absolutely favorite). With that in mind, I went to town. 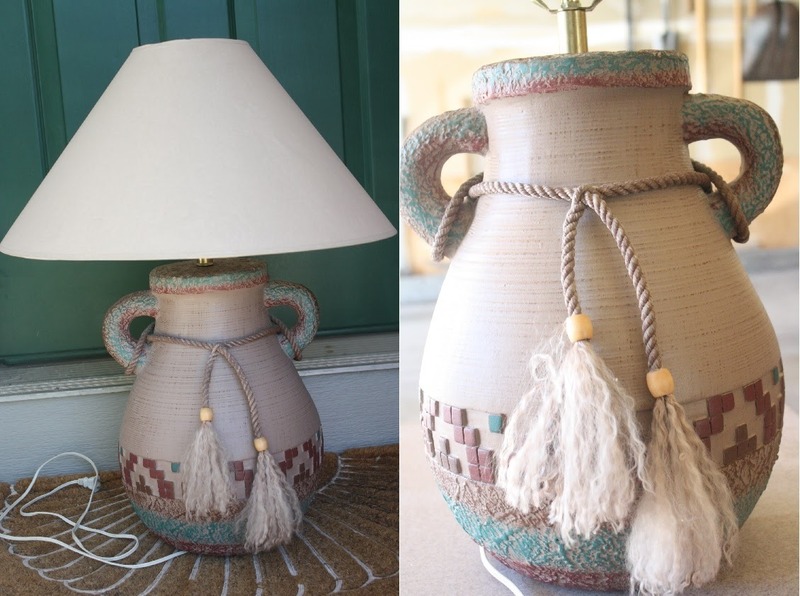 First thing I did was spray paint the entire lamp a light beige color. This would eliminate the southwest color scheme and give me a good base coat to work with. 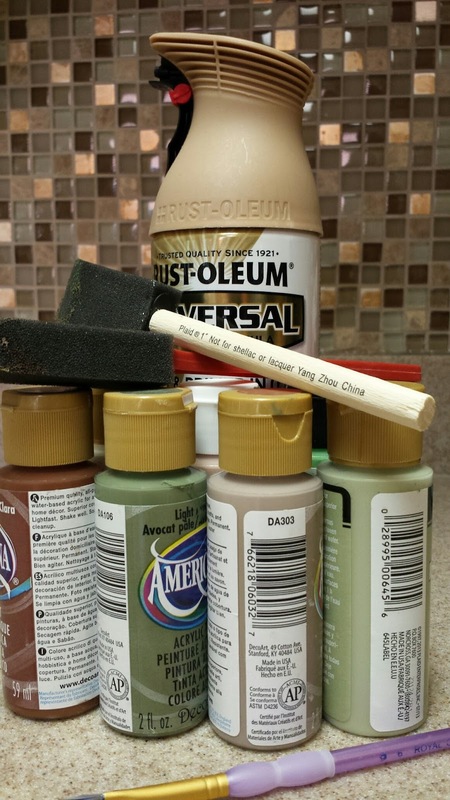 Next, I had a collection of craft paints with some of my colors already, a quick trip to Hobby Lobby with a 40% coupon allowed me to pick up a couple of the others that I needed. 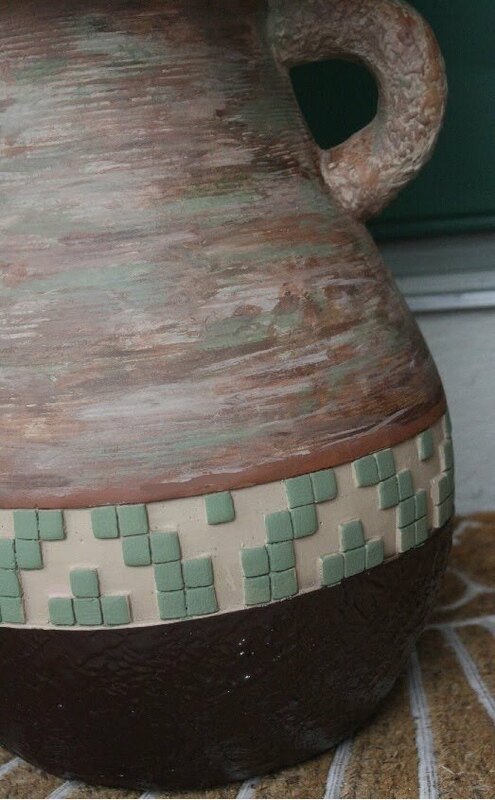 As for the look, I knew I still wanted to highlight the mosaic tiles in the center band and felt the bottom would look good in a separate color. For the majority of the base, I wanted to blend some of the colors together. The second step was to spray paint the bottom with the dark brown (I already had that leftover from another project). The base of the lamp was my own technique of sponging and blending. I'm really pleased with the way they turned out! They look great in our family room now and will look even better in the new house. So, for the cost of a little paint (roughly $8.00) and two new lampshades (just under $16 per shade at Walmart), I have two "new" lamps. What do you have in your home that could use a "makeover"? 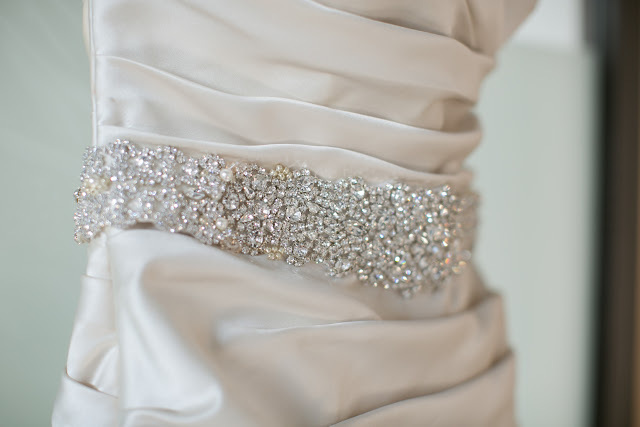 This particular belt was a stunning addition to this gown. Lindsay contacted me to make a custom belt for the beautiful champagne gown she purchased for her summer beach wedding. She definitely wanted it attached to the gown, plus she was hoping for a trim that would somewhat match her beautiful diamond halo engagement ring. 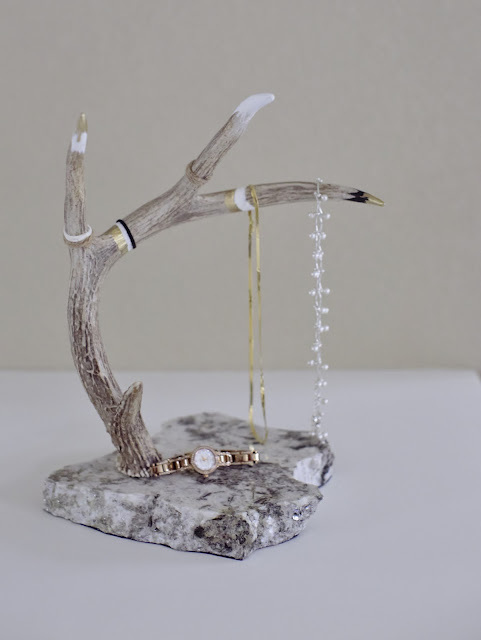 I found a large signature piece along with a separate trim that was a nice match to her ring. Between the two pieces, and some additional pearls and gold beads, I was able to put together a belt for her gown that screamed elegance. Lindsay wore her gown for the beach wedding in Mexico and about a month later for the reception she had in Colorado for family and friends. She looked absolutely beautiful. Congratulations Mr. and Mrs. Rider. Best Wishes on a long and happy marriage! I love lettuce wraps....Although, I've had some excellent ones (PF Chang's) and some okay versions, I enjoy the flavor of the seasoned meat with the crispness of the fresh lettuce. Recently, I've seen some recipes via Facebook of PF Chang's knock-offs. So I thought I would give it a try, especially since PF Chang's are my favorite to date. These go together very quickly; in roughly 30-40 minutes you're ready to eat (that includes the prep time). Heat olive oil in a saucepan over medium high heat. Add chicken and cook until browned, about 35 minutes; crumble as you go. Drain the excess fat. Stir in garlic, onion, hoison sauce, soy sauce, rice wine vinegar, ginger and sriracha until the onions have become translucent, about 10 minutes. Stir in the chestnuts and green onions until tender, approximately another 10 minutes; season with salt and pepper to taste, Spoon several tablespoons of the chicken mixture into the center of the lettuce leaf; folding or rolling.